Scale: 8.7 miles to 1inch. Handy little full colour map of Scotland. It is double-sided with southern Scotland and the central belt on one side and the highlands and islands on the reverse. Ideal for the pocket, bag or glovebox of the car. MAIN FEATURES Clear, detailed, full colour route planning mapping is presented in a handy format ideal for the pocket or handbag. 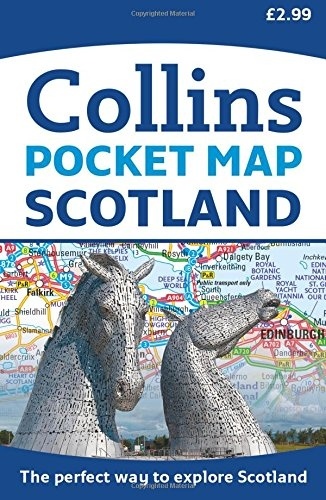 It is excellent value at only GBP1.99 and covers the whole of Scotland on a double sided map. INCLUDES / Tourist routes marked on the map / Top 100 places of interest / Park and Ride locations shown AREA OF COVERAGE Covers the whole of Scotland on a double-sided sheet. With southern and central Scotland on one side and northern Scotland on the other. WHO THE PRODUCT IS OF INTEREST TO Essential for those planning a trip or who want a cheap and easy to use back up for a sat nav.